ADATA on Thursday introduced its first lineup of SSDs powered by 3D MLC NAND flash memory. The XPG SX8000 drives promise up to 2.4 GB/s read speed as well as the enhanced reliability of 3D NAND. ADATA’s XPG SX8000 lineup of SSDs will include 128 GB, 256 GB, 512 GB and 1 TB configurations, offering different levels of performance at different price points. The drives are based on Silicon Motion’s SM2260 controller (which sports two ARM Cortex cores, has eight NAND flash channels, LDPC ECC technology, 256-bit AES support and so on) and 3D MLC NAND flash from an unknown manufacturer (IMFT is the most likely supplier, but SK Hynix is a possible supplier as well). The drives come in M.2-2280 form-factor and use PCIe 3.0 x4 interface. The manufacturer rates XPG SX8000’s sequential read performance at up to 2400 MB/s and its write performance at up to 1000 MB/s when pseudo-SLC caching is used. As for random performance, the new drives can deliver up to 100K/140K 4KB read/write IOPS. It is important to note that the 128 GB model is considerably slower than other SKUs in the family and the drive needs 512 GB configuration to demonstrate all the capabilities of the SM2260 controller. 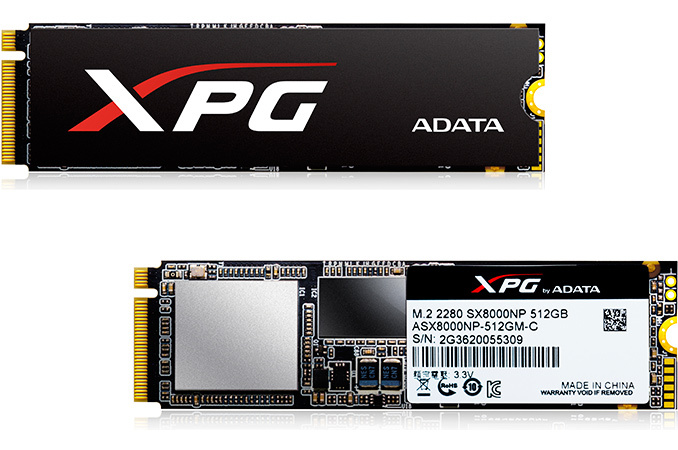 Since the SX8000 SSDs belong to ADATA’s flagship XPG lineup, the company ships such drives with a five-year warranty. Moreover, thanks to improved reliability of 3D NAND compared to traditional planar NAND made using ultra-small process technology, the manufacturer also rates the XPG SX8000 for two million hours MTBF, 0.5 million (or 33%) higher compared to previous-gen XPG SSDs. For several years, Samsung has been the only supplier of high-end SSDs based on 3D MLC NAND flash memory, offering high performance and improved reliability. Recently companies like IMFT started mass production of their 3D NAND for SSDs and independent makers of drives can now release their own SSDs featuring 3D MLC flash. Being one of the largest suppliers of NAND-based storage devices, ADATA is naturally among the first to offer advanced SSDs powered by 3D MLC with its XPG SX8000 family. But what is noteworthy is that last month Micron (which co-owns IMFT with Intel) decided to cancel its 3D MLC/SM2260-based Crucial Ballistix TX3 M.2 SSDs for an undisclosed reason. As a result, ADATA gets to join a rather exclusive club of non-Samsung M.2 NVMe drive vendors. Unfortuantely however, prices have yet to be announced, so we'll have to see if (and by how much) ADATA pushes prices below what Toshiba and Samsung have been charging for their own M.2 NVMe SSDs. Finally, along with today's release, ADATA is also prepping an upgraded version of the XPG SX8000 due in late October, which will feature increased performance. The upcoming SSDs are primarily geared towards desktop users and will require a heatsink, making them incompatible with the vast majority of notebooks. "But what is noteworthy is that last month Micron (which co-owns IMFT with Intel) decided to cancel its 3D MLC/SM2260-based Crucial Ballistix TX3 M.2 SSDs for an undisclosed reason." 5 years warranty sounds good, but "them speeds" are more akin TLC than MLC. Not that sequential performance are a critical factor, not at those levels anyway, and it could make up on random access, which samsung ain't too great at despite their high sequential transfer rates. Still Samsung is only 35% in revenue, looking at units sold and silicon utilized they are worse than others, for example worse than Intel and Toshiba in fact they have a better utilization of involved silicon wafers. It is not all gold in Samsung house, and now they have a lot of new contenders in 3D drivers. Only OEM final prices will say who will be the winner in upcoming years. Did ADATA release write endurance numbers as far as TBs written? A straight MTBF is kind of useless on a SSD, seeing as it's writing to the flash hat typically kills them, not run time. FYI: Endurance is a useless number on SSDs these days. Don't worry about endurance, because unless you're using a consumer-drive for enterprise workloads (ie: 24/7 heavy I/O) then the drive's warranty will be out far before NAND endurance causes data loss.